This year we are having more than just a golf tournament…. Please join us for this exciting weekend! There is the 11th Annual Home of Heroes Golf Tournament on May 10th, followed by a fun 19th hole reception with complimentary beer and wine gathering that afternoon at the Pueblo Aircraft Museum. 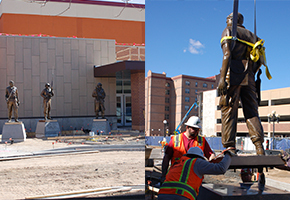 On Saturday, May 11th at 10:00 a.m. a Rededication Ceremony open to the public will be held at the Pueblo Convention Center at the Medal of Honor Memorial to show off the beautiful new Plaza. Medal of Honor recipients Drew Dix, Bob Patterson and Hiroshi Miyamura. Following that is a special ticketed luncheon at which we will honor the Pueblo Veterans Ritual Team with the Pueblo Home of Heroes ‘Pueblo Patriotic Citizens of the Year Award’. These dedicated veterans belong to an honor guard that has been active for over 30 years and dedicates thousands of hours each year to provide military funeral services for area veterans who have passed away. President Dwight D. Eisenhower upon presenting Raymond G. “Jerry” Murphy with his Medal in 1953 commented, “What is it…something in the water out there in Pueblo? All you guys turn out to be heroes!” In 1993 Colorado Representative Scott McInnis had read into the Congressional Record information about Pueblo and it’s recipients of the Medal of Honor. He cited at that time that it was the only city to have this record of four living recipients from the same hometown. Following that declaration in the Congressional Record, the Pueblo City Council adopted the “Home of Heroes” theme. Since then, Pueblo has continued to show it’s increased pride in military. It hosted the Congressional Medal of Honor National Convention in September of 2000 and unveiled four sculptures to Crawford, Sitter, Murphy and Dix as well as listing on granite plates the names of ALL Medal of Honor Recipients since Civil War times when the award was first created. The first of the annual Home of Heroes Rifle Match was held at the Pueblo County High gymnasium on Saturday, October 29th with over 20 schools from throughout Colorado participating. Almost 100 shooters took part in the four hour event. Jim Stuart, representing the Pueblo Home of Heroes Association, who sponsored the brand new traveling trophy, presented the winning team from Fountain/Ft. Carson High School with their trophy.